Pop quiz. 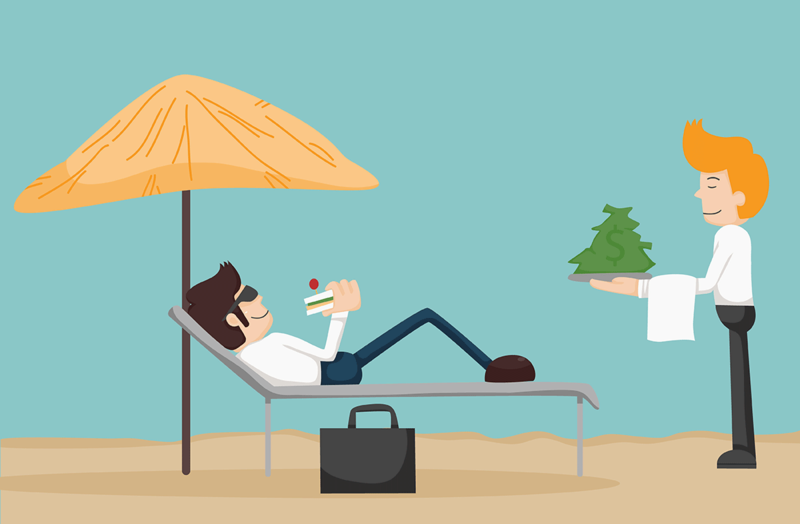 What is the definition of passive income? A. Making fat stacks without ever having to lift a finger. B. Income earned from an enterprise in which you are not actively involved, but which you created through an initial investment. C. Income that leaves angry notes on the pile of unwashed dishes. If you guessed B, you're correct. Or you're just good at guessing. Passive income isn't a magical spell you can cast on your bank account. It's about creating an enterprise or a set of circumstances that will eventually yield profit while requiring minimal maintenance. If you're willing to invest the time, the money, or both, here are four methods of generating passive income. Have you ever lent money to a friend, only for them to try and pay you back in expired Chili's coupons? Do you believe that you and your hard-earned money are destined for more than expired Chili's coupons? Consider becoming a peer to peer (P2P) lender. This relatively new industry allows individuals to lend money to other, unrelated individuals through online platforms such as Prosper and Lending Club. P2P lending removes traditional financial intermediaries from the mix, offers better interest rates to borrowers and allows lenders, or "investors," to make money off their loans. Becoming a P2P investor is relatively simple. Most platforms will allow investors to invest as little as $25, and you'll most likely see your first returns after a month to a month and a half. It should be noted that the laws of P2P lending differ from country to country and state to state, so be sure to check if you're eligible. If you live in the United States, for example, this map will tell you if your state allows P2P lending. If you have the capital, buying a property and renting it out is an effective passive income generator. But not all of us can afford to buy a house or apartment for renting purposes. Fortunately, the sharing economy has made renting out your place easier and more cost-effective than ever. Whether you live in a three story beach house in San Diego or a studio apartment above a Brooklyn bodega, sites like Airbnb and Guesthouser can help you rent it out and make money. If you own a car, you can use a service like RelayRides to rent that out as well. The only real requirement on your end is arranging a pick up time and handing over the keys. I can personally attest to the passive income powers of the sharing economy. I live in a tiny studio apartment in Denver, and using Airbnb, I make an extra few hundred dollars a month by renting it out when I'm not there. For me, the bulk of the work involves cleaning the apartment and washing towels and sheets. It's easy and relatively hands off. However, renting out your property can pose some risks. After all, you're allowing a stranger to live in your home or drive your car without any supervision. They might get into an accident or steal something from your apartment. Fortunately, services like Airbnb and RelayRides provide sizable insurance policies. In the event of an accident or a theft, both of these services will compensate you up to $1 million. So far no one has stolen anything from my admittedly bare bones apartment. In fact, guests have gone so far as to leave me things they couldn't take with them, including bottles of wine, food, and even a fridge magnet. There are people who make $10 a year from niche sites, and there are people who make $5,000 a month. It really all depends on how much work you put in upfront. For a detailed guide on creating a niche site, Doug Cunnington's guide is an excellent resource. But let's lay down the basics. A niche site is a website focused on a niche subject. This could be anything from a hobby, to a product, to a how-to. As long as the subject of your site has a specific, yet active audience, it's a viable niche. Before you start earning passive income, you first need to build a website or blog, then add content, and then market it. If you integrate proven strategies into this endeavor such as content marketing, SEO and social media marketing, you will see traffic. You can monetize your niche site with ads or affiliate links. If you're after larger profits, affiliate links are the way to go. These are unique links that promote a product or service, and when a user purchases that product or service by clicking through via your affiliate link, you receive a sales commission. For a more detailed guide to affiliate marketing, read my article about ClickBank. If you know a thing or two about programming, or you're confident in your ability learn new tech skills, consider building a mobile app. While you'll have to initially invest a good chunk of time, once your app hits the marketplace, your job is (mostly) done. Unless you're a professional programmer, or you have a team of professional programmers, you want to keep your app simple. You also want to create an app that solves a problem and/or makes a user's life easier, and has low competition. Unless you're a quantum mechanic, you can't create something out of nothing. To generate passive income, you must first invest money, time or both to reap the long-term benefits. Like anything worth doing, it takes work, but if you have the drive, dedication and a cozy studio apartment in walking distance of a great bar, that work will pay off.